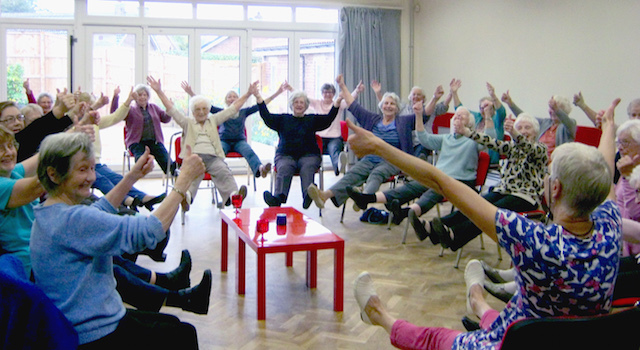 Dancing for Well-Being | Enjoying music, fun and laughter together. Enjoying music, fun and laughter together. What is Dancing for Well-Being? Do you think your dancing days are over? Well don’t give up just yet! Come and join one of our weekly Dancing for Well-Being groups in the Harrogate district – you may find just what you’re looking for. Dancing for Well-Being is ideal if you find other dancing or exercise classes too much, for example, if you have mobility or balance problems, if you use a walking aid or a wheelchair, or if you find co-ordination or remembering moves difficult. A growing body of research is showing how dancing improves physical and emotional well-being in later years. It’s been shown to be beneficial for people with a number of conditions including arthritis, Parkinson’s disease, dementia and depression. Dancing for Well-Being is good exercise, it’s gentle and safe, it’s great for company and friendship, it’s relaxing and uplifting, but most important of all it’s FUN! Groups meet weekly and cost £5 (including refreshments). This group is currently full and there is a waiting list. If you want to join please do get in touch and we will put your name on the list. 2.30 p.m. – 4.00 p.m.
11.00 a.m. – 12.30 p.m.
2.30 p.m. – 4.00 p.m. (3.00 p.m. – 4.30 p.m. on every second Wednesday in the month). Our groups are generously supported by North Yorkshire County Council and the County Councillor Locality Budgets scheme, the Big Lottery Fund, The Local Fund: Harrogate & District, Two Ridings Community Foundation, Versus Arthrtitis Harrogate and the Postcode Community Trust. Registered as a Community Interest Company.